The National Archives has a wealth of records and information documenting the U.S. experience in the Vietnam conflict, including photographs, textual and electronic records, audiovisual recordings, exhibits, educational resources, articles, blog posts, lectures, and events. To coincide with the opening of the our newest exhibit, Remembering Vietnam, we've launched a Vietnam War research portal. This portal creates a central space for all National Archives resources and content related to the Vietnam War for use by researchers, students and educators, museum goers, veterans, and those curious about the conflict. 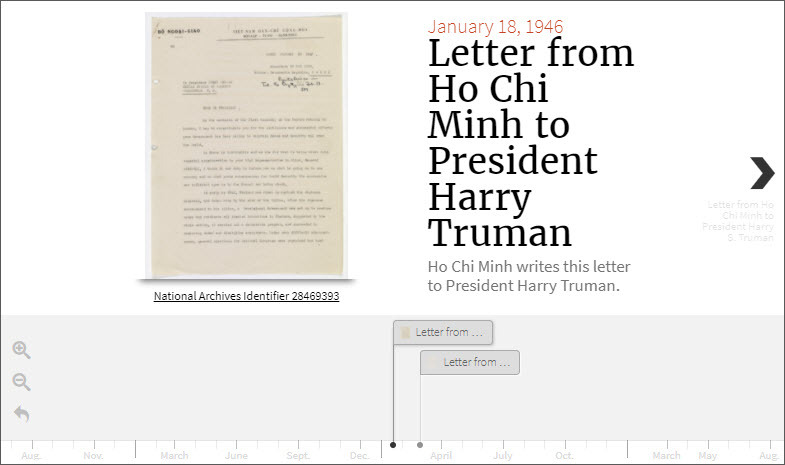 Browse our interactive timeline to journey through events with select records from the National Archives Catalog. You can also explore the Vietnam conflict by topic areas: Diplomacy, In Country, The War at Home, and Post-Conflict Events. Each topic page includes links to digitized records and photographs in the Catalog, descriptions of records available for research, educator resources, articles and blog posts and more. Are you looking to volunteer as a citizen archivist? One of our current missions asks for your help to transcribe the captions and tag features in these black and white photographs of Marine Corps activities in Vietnam. Start tagging and transcribing on our Citizen Archivist Dashboard. Check it out! We'd love to hear your thoughts on the Vietnam War research portal. Have you learned something new or found a unique photo or an interesting record? Please share with us! Email us at citizenarchivist@nara.gov.